I got the binary (.bin file) from the previous step and flashed it in serialflash. The AT91Bootstrap bootloader is started and it copies bytes from 0x8000 (thats where the application is stored). I have chacked that the application is not bigger than 0xa0000, so the whole programm must be copied. BUT nothing happens after the last output of the AT91Bootstrap. If i flash the (expected) u-boot.bin to 0x8000 the u-boot binary is executed and i get the u-boot output. I have also tried the IAR Embedded Workbench with the segger j-link plus and with these tools I am able to flash and run the app. BUT i am not able to automatically run the app after powering the board (without using the IAR Embedded Workbench). And I also do not want to buy the IAR Embedded Workbench. How to build and flash the getting-started example that the board executes the application after powering. JR9020 wrote: What am I doing wrong? You were concerned about (but verified) the length of the transfer and the source address, but failed to question the target address. The 0x26f00000 target address in use is the default load address for U-Boot, which is why u-boot.bin successfully executes. The DRAM Softpack example that you built and want to execute has a load address of 0x20000000. These binary images are non-relocateable code. They must be loaded to memory at the address specified when they were built (i.e. linked). Study the output of the linker (e.g. the symbol map file) to confirm. The proper correction is in your step 1 when you build AT91Bootstrap. The default configurations provided are only for booting U-Boot. You need to reconfigure the build to boot an alternate program. Use the `make menuconfig` command to perform the needed changes. Under `Image Loading Strategy` select one of the `Load x MB into start of SDRAM` choices that you deem adequate. Under `Demo Application Image Storage Setup` configure the entries appropriate to your application, especially the `External Ram Address`, which represents the load address. For the `Image Name` use an appropriate name such as "softpack.bin". JR9020 wrote: As first example I want to run the "getting-started". I think that I also need the AT91Bootstrap second level bootloader to load the main application from boot media to main memory? There's more than one memory on the board. See this post. There are two versions of the "getting-started" example program, one for each type of memory. To execute the DRAM version, yes, you would need an intermediate program to initialize dynamic RAM prior to loading. JR9020 wrote: How to build and flash the getting-started example that the board executes the application after powering. Seems like you're almost there, except for the missing re-configuration of AT91Bootstrap. Note that there are alternate boot schemes, such as using U-Boot as a third-level boot program. U-Boot can (when properly configured) load binary images from different media (e.g. SDcard) and over a network (e.g. using TFTP), and then execute them (using a `go` command) or store them. These commands can be entered interactively or stored for automatic execution on boot. In the long run IMO, experience with U-Boot will be more valuable than proficiency with the Atmel SAM-BA utility. thank you for your answer. I configured the at91bootstrap as you suggested and now it works. I did everything according to the above instructions and have the following situation: "getting-started.bin" with SPIFlash is copied into DDRAM (at 0x20000000) but does not want to be executed. So, if I load "getting-started.bin" from the IAR into DDRAM then it works, but if the same "getting-started.bin" is loaded into DDRAM using bootstrap then it does not works. "Get-started.bin" is actually loaded into DDRAM, because I can see its code after Power-On using the "Debud without downloading" mode in IAR over j-link adapter. Where can I do wrong? But apparently you have a different built environment, i.e. you mention IAR whereas the OP used a GNU toolchain. Oleksandr wrote: ... but does not want to be executed. That's not an observable fact, but rather your conjecture about a personified object. This first sentence makes all your claims suspect. Since you have a "j-link adapter", debug the code when AT91Bootstrap jumps to 0x20000000. If all you provide are vague descriptions and a list of instructions, then do not expect a positive resolution to your problem. If you study the OP's post, you should notice that there's a detailed description of steps performed and then the results of executing the program. There is information sufficient to pinpoint the problem and offer the solution. You on the other hand, have only provided vague summations. Nobody has the time and imagination to think of all the ways that you could make mistakes. What kind of vague description are you talking about? This is a clear list of steps that I personally carried out and documented. Why not focus on providing detailed descriptions of the results of what you did instead of complaining? Firstly, you named the work that I performed as "an vague description"
You are a "valuable contributor", not me, not others, but you. Therefore, I appeal to you for help. If I were such a cool guy, I would not ask for help here. Thirdly, I'm new to Linux and Atmel. All time I worked with 8051 and stm32. In quality IDE used Keil uVision 5 under Windows. And here everything is new - the compiler, the processor, the operating system. I came to the forum for help but something went wrong. I also do not speak English well. Now let's go back to the question: what's wrong with the description? Why do not you want to read it? I tried, made out, took screenshots. For whatever reason, there was only one page viewable the first time I looked at your document. I still cannot determine what toolchain version you used to build AT91Bootstrap. Try the advice from this post on using a proven toolchain. Note that the download command is for a 32-bit toolchain, whereas the Linux4SAM webpage is for a 64-bit toolchain. What do I wrong when building the at91bootstrap and the app for SRAM? The program is not loaded and executed. That is a memory map. There's no information whatsoever about "where to flash" anything. The map information is for where an image from flash should be loaded in memory, i.e. SRAM or DRAM. Where things go in NAND flash is up to you. The general rule is that images should be aligned with erase pages. The AT91Bootstrap image (with the PMECC header) has to be at NAND location zero to comply with SoC boot requirements. Locations for other images are under software control. Exactly what did you "adjust" in AT91Bootstrap? There is no load into SRAM option in AT91Bootstrap. Are you getting confused with acronyms SRAM versus SDRAM? SRAM is static RAM (which in this case is internal to the SoC). SDRAM is synchronous dynamic RAM, i.e. DRAM (which in this case is external to the SoC). DDRAM is a contraction for double-data-rate dynamic RAM, i.e. DRAM (which in this case is external to the SoC). JR9020 wrote: What do I wrong when building the at91bootstrap and the app for SRAM? The program is not loaded and executed. AT91Bootstrap is loaded and executing out of the internal SRAM. You cannot load another program into the same address space of SRAM while that boot program is executing. Perhaps instead of just words on page, you need to graphically draw this on paper. Refer to the Linux4SAM web page on the conventional Atmel AT91SAM Boot Sequence for Linux. The left side lists the execution order of boot programs (you're only concerned with #1 and #2, and your app would be #3). The right side describes the physical memories involved and the transfer of code & data. If you insist on building an app to execute in SRAM, then it would have to replace AT91Bootstrap. 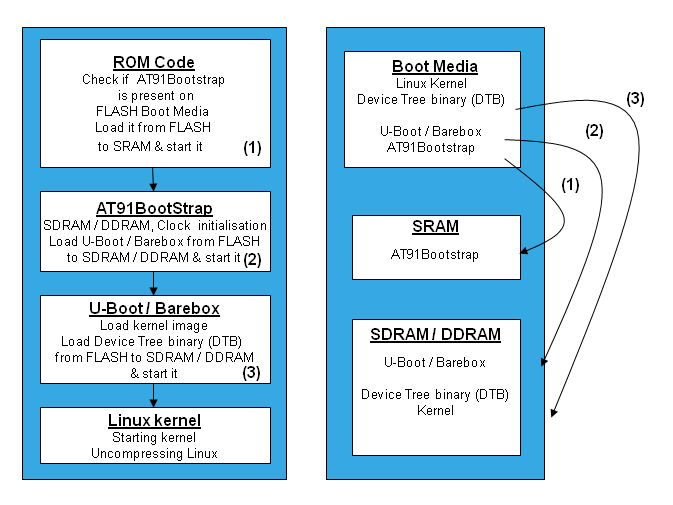 OR boot into U-Boot, and use it capabilities to execute apps in SRAM or DRAM. first, thank you blue_z for always responding so fast. second, thank you for your answer and now the whole stuff is more clear to me. ... first the at91bootstrap.bin is booted and then the application is loaded after power up the board. Use push buttons or console key 0 to 2. Press the number of the led to make it start or stop blinking. I have received a software library (under NDA) from Atmel and I build it like the examples from the atmel-software-package (that works) but the definition of the environment variable VARIANT has no influence on the build. So I do not know whether it is build for SRAM or for SDRAM/DDRAM. I tried with and without the at91bootstrap (as explained above), but i could not manage to run the example demo of the software library which i reveived from Atmel. What do I have to do in order to run the application correctly on the sama5d2-xplained. I would prefer to use the at91bootstrap and load the app in DDRAM. JR9020 wrote: I have received a software library (under NDA) from Atmel and I build it like the examples from the atmel-software-package (that works) but the definition of the environment variable VARIANT has no influence on the build. Technically a library would only consist of procedures that are callable, and you would have to write a main program to invoke these procedures from the library. You seem to imply that there is an included program (and makefile) that can be built. It would be a rare program that used such a VARIANT variable. Such a memory specifier actually translates to a specific memory address and region, which are salient parameters when linking standalone programs. IOW internal SRAM maps to 0x00200000, and external DRAM maps to 0x20000000 (i.e. their respective first addresses). JR9020 wrote: So I do not know whether it is build for SRAM or for SDRAM/DDRAM. Inspection of the .map file should indicate what you have built. The value of .textEntry should indicate where the program is located. The value of .stack should indicate where the top of the stack is located. Inspect the SRAM and DRAM versions of getting-started-*.map for comparison. JR9020 wrote: What do I have to do in order to run the application correctly on the sama5d2-xplained. I would prefer to use the at91bootstrap and load the app in DDRAM. That should be under your control since the program's start address would be specified in the Makefile and/or .ld linker file. I don't know what library you have, so I cannot give precise advice; I haven't signed any NDAs. You're going to have to evaluate the files and code in this library, and learn how to use it. If it's related to Secure Boot, then maybe it should be part of (or replaces) the second-stage bootloader (i.e. AT91Bootstrap)? Or is it a library that expects/requires a Linux environment?